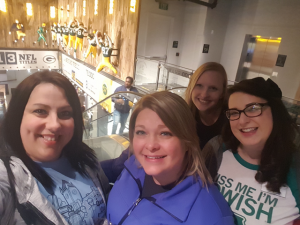 During the week of February 27-March 3, a group of UWECI staff traveled to Green Bay, WI for United Way of Wisconsin's Great Rivers Conference. The Great Rivers Conference is an annual regional conference which brings more than 300 United Way professionals from 12 states together to network, learn, and engage. It's a great opportunity for our staff to attend this conference and bring back new knowledge to use in our own community. I learned about what people want to know about United Way and how to engage people in our community. I enjoyed getting to network with people in various positions at other United Ways, especially meeting Neil Parekh, who is the Director of Network Communications for United Way Worldwide. Heard from various VITA sites about expediting tax returns, providing financial coaching year-round, and improving marketing strategies. Also learned from other 2-1-1 call centers about providing outbound calling to registered individuals. It was a great networking and overall learning experience both in my field and other sectors of United Way. Through the workshop, Presenting with Power, I learned to never start with, "My name is ___, and I am here to talk about ___," and instead begin with a startling statement/story. They also suggested using Q&A to summarize your message instead of losing its meaning at the end. If you'd like to hear more about our staff's experience at Great Rivers, please contact them using info on our staff page.